Today we will guide you through the process of creating temporary and permanent redirects with Nginx web server. URL Redirect or also known as URL Forwarding, is a technique to redirect a domain name or an URL from a location to another. The common use for this redirection is when a page on your site has a good SEO ranking, and you need to change it for a specific reason. For example, you are switching from a CMS to another, this will make your URL structure changed. So, in order to keep your existing SEO rank of a page, you can redirect/forward the old URL to the new ones. HTTP 301 status code means that a page has been permanently moved to another location. For example, you have a page at http://domainone.com/contactus/ and you want to redirect it to the newly developed one at http://domainone.com/contact-us/. If you want to keep your SEO ranking, you need to make 301 redirect. If you used 302 redirect, search engines will keep the old page indexed, and think your new page as duplication. HTTP 302 status code means that a page has been temporarily moved to another location. For example, you have a contact page at http://domainone.com/contact-us/ and you are redesigning it. To avoid your visitors from seeing the unfinished page, you can make a 302 redirection to another page, or even to the main page. In this guide, we will discuss and show you how to create temporary and permanent redirects with nginx. Now, if you have a list of URLs to redirect, it is better to use a map. Please note that the map definition should be placed ourside of the server block. When a visitor type https://www.yourdomainone.com on his web browser, your server will response to it and serve the website to the visitor. It means your server is serving https in both www and non www version of your domain. This is bad for SEO, you will want to choose the final URL, with www or without www. We need to define a seperate server block for the www version. Do not forget to issue “nginx -t” command after editing your nginx configuration files, then restart the service. 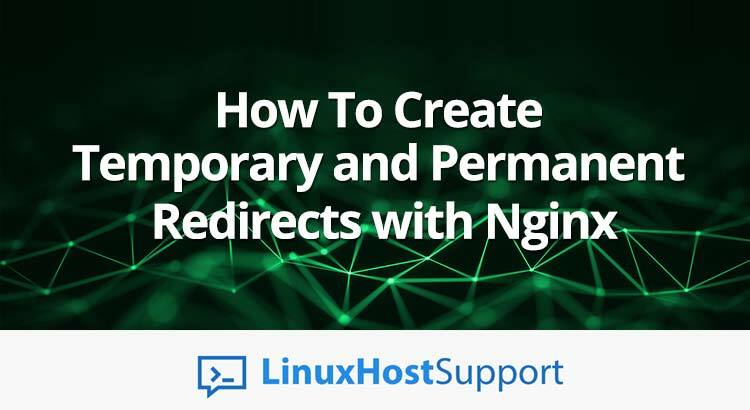 With completing this tutorial, you should know how to create temporary and permanent redirects with Nginx. Of course, you don’t need to get troubled with your server if you are one of our server support services client – in which case, our technical support team will help you in creating temporary and permanent redirects with Nginx. They are available 24/7, and can cater to any questions or requests. PS. If you liked this post, feel free to share it with your friends by using the social media share shortcuts below, or simply leave a comment. Thanks.